I am getting inspired to cook everywhere these days! The inspiration for this recipe was two-fold. The first inspiration is the fact that it is about 115 degrees with the heat index today. And really, who wants to turn a stove on in this weather. The second inspiration is Chef Robin White’s #ColdSoupWeek. Chef Robin is posting the recipes now for the soups that will be included, and her Watermelon Soup struck a chord for me…so here we are! I winged it on this one. And in all honesty, I kind of expected this to turn out as a flop. Imagine my surprise when I wanted to eat the entire batch in one sitting! The soup is refreshing. While it is based on my favorite summer food, the watermelon, it has a nice earthy undertone thanks to the jalapeno. But don’t skip on the yogurt and feta toppings! These extras really bring all of the flavors of this soup together. I’m thinking Watermelon Soup Shooters are coming with me to my next potluck! You will be blending ingredients in two halves. Place one half of all ingredients (except for yogurt & feta) in a blender, food processor, or container for an immersion blender. Blend ingredients until smooth and move to a large bowl. Blend other half of ingredients until smooth and then add to other half of soup. Spoon soup into serving bowls. Top each bowl with a dollop of yogurt and a sprinkle of feta cheese. 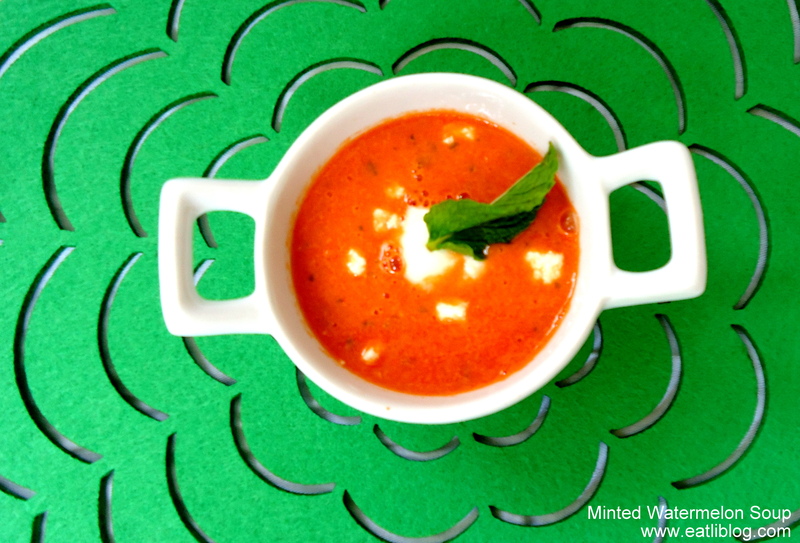 This entry was posted in Recipes and tagged chilled, col soup, cold, hot weather, mint, potluck, recipe, soup, summer, watermelon by reneeh. Bookmark the permalink. I’m not the biggest fan of cold soups but this sounds absolutely perfect for a day like today. I love, love, love the addition of jalapeno to this! You are so right! 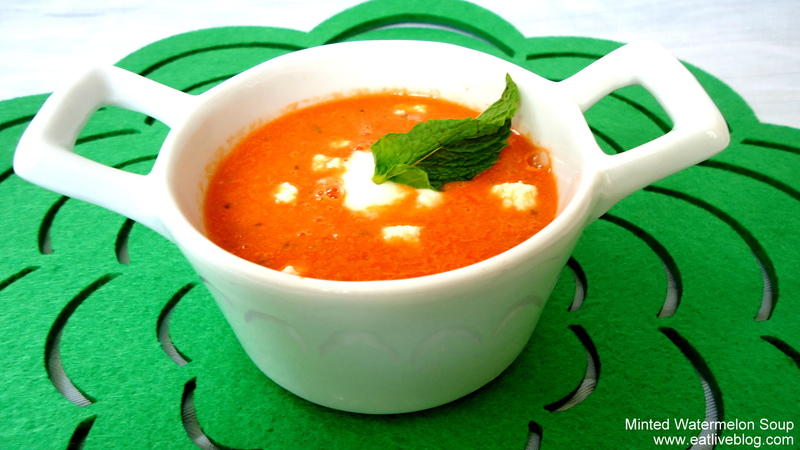 Today is a PERFECT day for a chilled soup! I’ve been trying to experiment with watermelon more lately-this sounds like a great way to check it out more! Fiona- I also made juice this morning. 1/8 a watermelon, 6 large de-husked strawberries, a hand full of mint leaves and blend! It was so good! Looks so delicious!! I’m definitely going to try this! Today is definitely perfect for this soup. Looks great! Chilled soups in the hot weather are very refreshing. Thanks for sharing. I have to say I’ve never tried a watermelon soup before….intriguing!